This is thanks to the radical new Progressive Shell that adds reinforcement in key zones but reduces wall thickness overall to cut weight. Along with the Memory Fit 3D Liner for complete comfort. 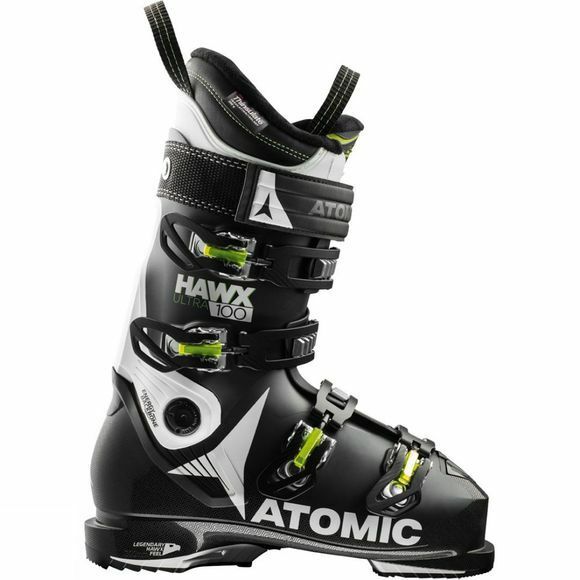 All in all, Hawx Ultra keeps your feet incredibly light and agile as you rip down the mountain, with the best combination of snow-feel and power ever felt in an all-mountain boot. Memory Fit 3D Liner, Pre-shaped heel and ankle areas mean no pressure points and a great foot hold. The one-piece toe box and Sidas footbeds provide continuous comfort. Then 3M Thinsulate Insulation keeps feet warm and responsive even in extremely cold and damp conditions. Energy Backbone, Reinforced, asymmetric backbone provides extra strength and edge grip for powerful skiing. Memory Fit, Create the perfect personalized fit in minutes with our advanced heat-fitting technology. Progressive Shell, A Revolutionary construction reduces weight by 25% for increased agility and snow feel while reinforcing key zones for stability and power transmission.